My son and I just got back from a week long missions trip to Guatemala where we worked with some schools in Peronia and La Tinta. It was such an amazing trip and I loved being able to serve in the schools alongside my son! I brought my paper and watercolors to Guatemala and was hoping for an opportunity to use them while I was there. During the school hours, there were many of the moms of the children hanging around and I asked them if I could paint them. Most of them have probably never seen a photograph of themselves before, let alone have someone paint a picture of them. They all wore the most beautiful clothing and had such gorgeous skin tones which made it extra fun for me to paint them! They were so excited to receive a fashion sketch of themselves and it was such a joy for me to give the sketches to them. These women work so hard and I felt such a burden for them. They give everything to their families and I felt honored to be able to give them a little treat like this. During recess the kids started coming over to see what I was doing and boy did I have a crowd! They loved watching me work and seemed fascinated by the whole thing. I painted one after another as fast as I could go! They were all lined up begging to get one! I loved being able to show them art in action like this and was really hoping to inspire these kids to want to explore the world of art. I hope I did! Even though I was trying to inspire others, I, myself, was inspired through this experience to find more ways to serve and bless others through my art. After coming home from my artist residency in Wales, I needed a way to show my friends and family what I had been working on and an art show was the perfect way to do that. 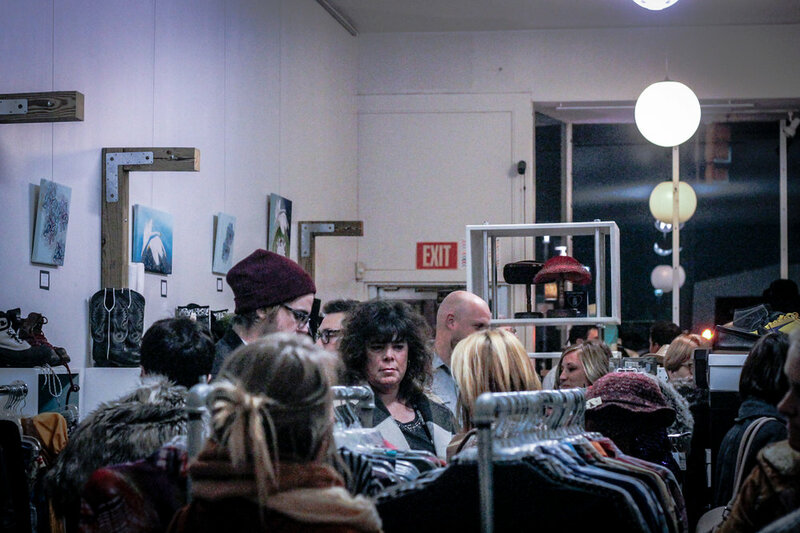 On November 26th, Small Business Saturday, I had an art show opening reception at a boutique called Revival here in Akron, Ohio. Revival is a really cool little shop that sells vintage and new clothing and accessories along with other unique finds. Every month they have a new artist showcase their work on the walls of the shop. Since most of my art up to this point has been commissioned work for people, I have never had a large enough body of my own personal work to display in a gallery. I have had one or two paintings hanging in a gallery at a time, but this was the first time I had enough pieces to have my own exhibition. I just loved the idea of having my first show in a boutique! I love the idea of someone who would just stumble across my art because they are looking for a vintage frock, or come nose to nose with one of the women in my paintings as they sift through a rack of clothes. This was a great experience for me and has prepared for any future exhibitions. It was so thrilling for me to have some of my models show up for the event and see their faces as they looked at my paintings for the first time. Here is a quote from Audrey, the girl featured in my painting "In Her Mind's Eye" featured below: "It is so surreal to look at that face. Your ability to capture a person and put them on canvas amazes me. I'm thankful to be part of your journey to Wales!" I had a table with examples of 18X24 and 11X14 print sizes, and some fashion illustrations for sale. My favorite part of the whole night was having my sweet sister, Erica, with me all the way from North Carolina! She was my right hand man and did everything from refill people's wine to wrap up art that sold like these two little guys that she is holding. She was a huge support to me and I couldn't have done it without her! So thankful for such a great sister! Another highlight of the evening was having local singer songwriter, Jenny Baird, play music during the entire event. She really made it feel like a party in there and I enjoyed being next to her all night and hearing her sweet voice. She is so talented! I was busy the whole night doing fashion sketches of people who came to the show. I had a line that wouldn't end the entire time! My hand definitely got a work out for sure! These two women were awesome with their fun hats and personalities! The painting I did of them was definitely the most fun to do! There was such a great crowd in the room and I really enjoyed meeting lots of new people! For more information on booking me for live fashion sketching at events like this click HERE. What a great night! I am so thankful for everyone who came out to support me at my opening. I feel so loved! The art will be hung in Revival (822 W. Market Street, Akron) through the end of the month if you weren't able to make it. There are still originals available for purchase and prints available of all my work. Email me at taratories@gmail.com for any questions.